A friend of mine invited me to an event at Hearst towers for a new app launch. She told me that the apps name was Trench, I looked it up in the app store and made a profile. This was something that I had never seen before, shopping without real money but instead, the currency was diamonds! I had never been inside of Hearst before, but had an idea of what it looked right from watching So Cosmo on E!, and also The Blod Type on Freeform. (Both of these are reality tv, and millennial targeted tv shows based in NYC). The building is very close to Columbus Circle. Upon walking in you instantly notice this beautiful waterfall that sits along the escalators. After arriving in Hearst tower and making my way up into the room for the evening event, my eyes immediately went to what everyone was wearing. I also took in my surroundings. There was a rolling rack of clothes in the back, a step and repeat with the Trench logo, an open bar, small bites, and an amazing view of the city. Adi (the CEO & founder) was mingling amongst everyone, as well as Ansley (who works on coordinating pretty much everything). So what is Trench? 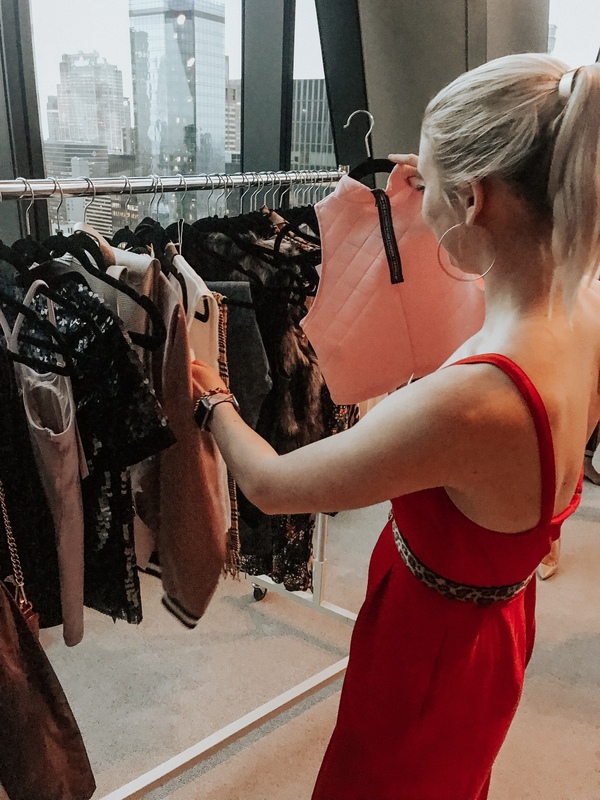 Trench is an app, and more specifically your never ending closet in the sense that once you wear something, it no longer needs to go to waste. I am sure that 80% of girls actively on Instagram no longer want to wear that same outfit again. Trench solves this with their app. The currency is diamonds instead of dollars, and you can swap clothing with diamonds, just pay shipping. This allows you to swap clothes in the sense that you are getting another clothing item that is the same value as what you sold. Vs the typical scenario of selling something on Poshmark for $10.00 that you originally paid $50.00 for. How did this app become more than just an idea and an actual product? Adi Shemesh is originally from Tel Aviv, Israel. After attending college for Economics and Business Administration, she eventually decided that she wanted to go the entrepreneurial route. Entrepreneurs are always trying to solve a problem or make something in life more functional- one of my favorite Podcasts that features entrepreneurs is NPR’s How I Built This. With the tech generation that we all live in now, there is not just a need, but more so an expectation to have something that works instantly. If an app is not easy to use or understand after about 15 seconds of waiting, I admit I will just close out of it. That is why it is so crucial to have everything working in tip-top shape before showing it to focus groups and investors. Time is money, and most of the time if you waste someone’s time, they won’t allow you to cost them any more time. Capital: Through seed funding, Adi was able to get enough people to back her idea. Crunchbase is a platform where you can essentially “creep” on entrepreneurs and which VCs backed them. Trench was founded in 2015, and went into a seed round for funding, but did not receive any investors. Fast forward three years Trench got $1.5 million in fundng. One of those investors was Hearst, which is amazing! Trench works inside of Hearst which is truly a dream office.